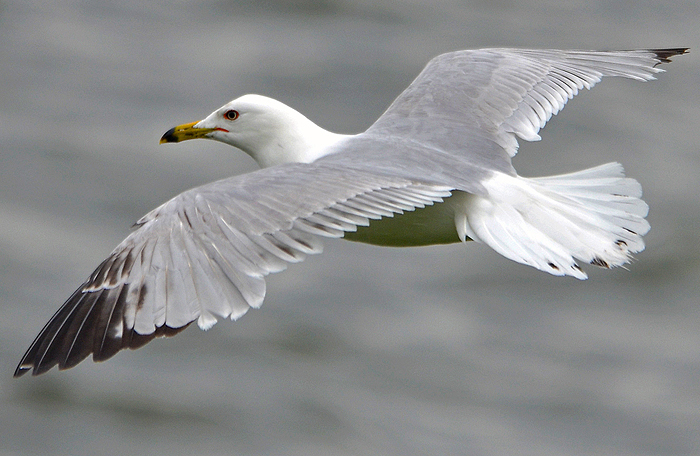 Ring-billed Gull - Larus delawarensis. 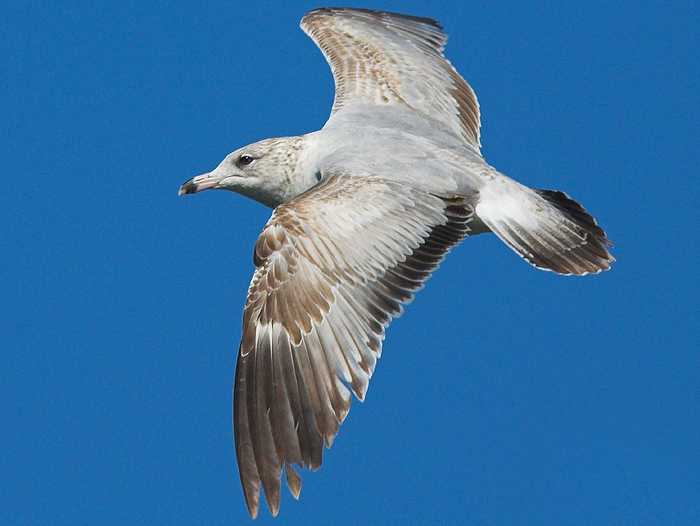 Description in "Gulls of North America, Europe, and Asia", by Klaus Malling Olsen & Hans Larsson, Princeton University Press. This is a copy of the chapter on Ring-billed Gull, written by Klaus Malling Olsen. "I" in the text refer to the author. If you find any errors, please let me know at marsmuusse at gmail dot com. above: Ring-billed Gull delawarensis juvenile, July 06 2012, Chicago, IL. (Amar Ayyash). below: Ring-billed Gull delawarensis 1st cycle (1CY), September 09 2012, Chicago, IL. (Amar Ayyash). Head, neck, breast and flanks whitish with coarse dark brownish spots or streaks. White eye-crescents as adult winter. Flanks and breast-sides with dark V-spots or scales, creating distinct barring, which may cover entire underparts (least on central belly). Sides of neck, breast and upper flanks sometimes almost uniform sooty-grey. 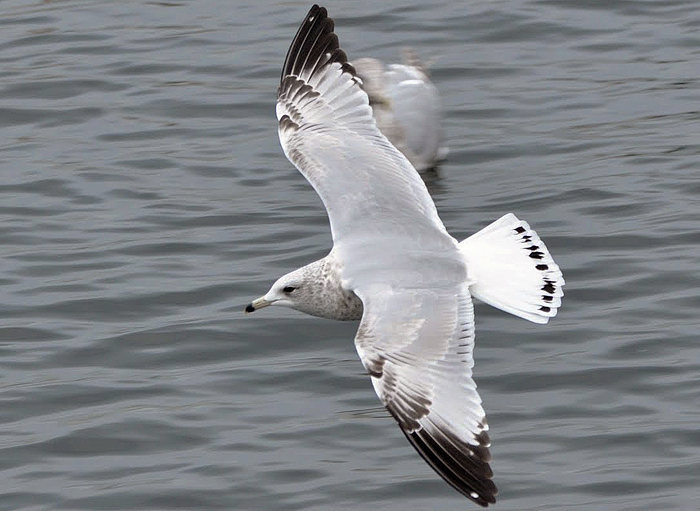 Undertail-coverts white with dark bars, generally stronger than in Common Gull. Mantle and scapulars grey-brown with varying dark subterminal bars or crescents and pale edges. Lesser coverts and median coverts with slightly pointed (rarely rounded) dark centres and sandy to whitish fringes. Greater coverts pale grey, usually with dark subterminal bars on inner 3-5 (rarely all, but on outermost normally restricted to dark subterminal bars near tip and base). All coverts rarely dark brown basally. Tertials and sometimes innermost greater coverts dark brown with narrow pale fringes, sometimes with irregular pale waving of fringe as in Herring, or with paler grey centres or dark ‘tooth’ onto pale tip. P6-10 and their coverts blackish-brown, the latter with narrow pale tips and sometimes grey subterminal spots on outer web. Inner primary coverts as outer or grey with dark shaft-streaks and subterminal fringes. P6-P10 have grey on the inner webs, increasing inwards. P1-P5 are pale grey with 10-20 mm dark subterminal spots. Rump and uppertail-coverts white with dark spots or bars. Tail whitish (often faintly greyish-tinged) with varying dark subterminal bar, typically broken by pale mottling or up to 2-3 dark ‘extra-bars’, e.g. as black spots on up to 8 mm white tail-tip. Inner webs of rectrices sometimes dark. T1 with 22-40 mm dark subterminal bar. T6 often pale grey to base or with indistinct dark mottling on inner part. 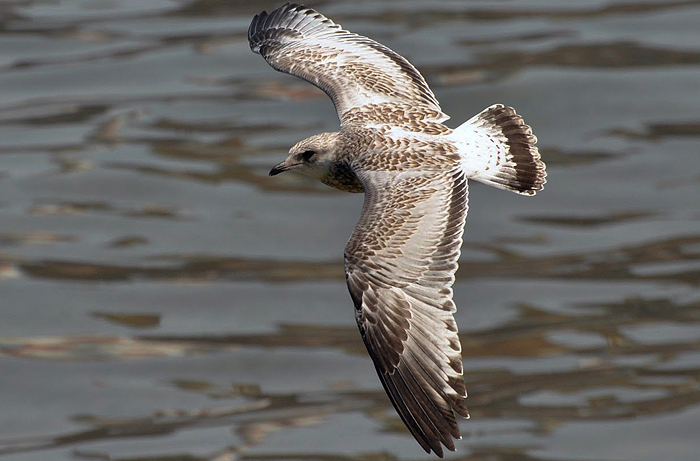 5-7% have tail similar to Common Gull, but generally with broader pale edges and grey shading onto base of T5-6. Rarely, most of tail dark with pale restricted to indistinct spotting on outer web of T6. Variation in tail pattern very large; rarely are two individuals the same. 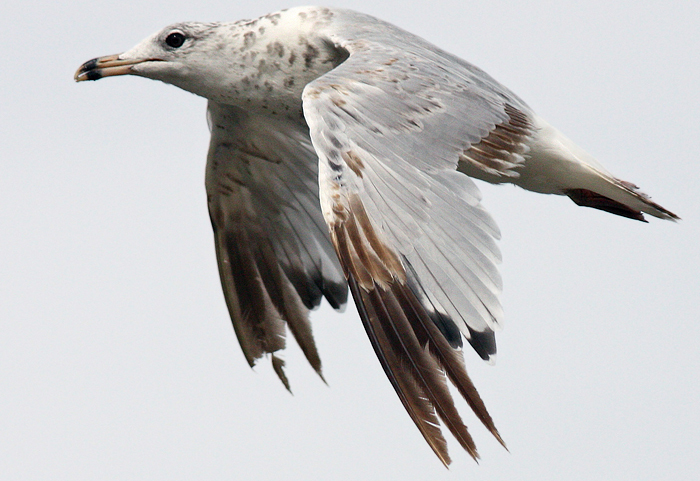 Underwing similar to Common Gull, but generally more contrasting with paler greater coverts, creating midwing-panel. Axillaries often with broad dark fringes, but sometimes whitish (especially in birds with almost unmarked greater coverts). Iris dark brown. Bill blackish with fleshy base; extreme tip rarely whitish. Legs flesh-pink, sometimes with greyish foot. above: Ring-billed Gull delawarensis 1st cycle (2CY), February 07 2007, Orlando, FL. (Patricia Ferguson). below: Ring-billed Gull delawarensis 1st cycle (1CY), December 03 2010, Sparks, Washoe Co, NV. (Fugle). As juvenile, but head and body whiter with more distinct grey-brown spots on lower hindneck and crescent marks on breast-sides and flanks. Mantle, scapulars and back pale grey with whitish feather-edges, disappearing with wear from midwinter. Some mantle feathers often with dark subterminal crescents, shaft-streaks or spots, creating uneven pattern. Juvenile mantle and scapulars often partly retained. Wing and tail as juvenile, but with wear (from late autumn), pattern on lesser and median coverts becomes weaker and dark areas browner. Sometimes shows striking contrast between worn brownish-centred lesser/ median coverts and tertials towards rest of plumage (especially in birds with dark grey breast-sides) from autumn. Bill fleshy to pink with 12-22 mm clear-cut black tip, often broadest on lower mandible; base rarely yellow or greenish-fleshy. Bill gets pale tip from (Nov-)Feb.
above: Ring-billed Gull delawarensis 1st PB moult (2CY), July 23 2009, Westmore, Vermont. (Jay). As first-winter, but head and body whiter with fainter dark spotting; often lacking, but sometimes strong on crown and ear-coverts. Mantle, scapulars and sometimes all median coverts pale grey. From June much worn: retained juvenile coverts fade to whitish, tertials / inner wing-coverts to pale brown, flight feathers to browner and dark pattern often reduced or lacking. Eye dark. Bill yellowish or pink with yellow or greyish tinge and dark subterminal bar / paler tip. Legs as first-winter, but sometimes greyish-yellow. above: Ring-billed Gull delawarensis 2nd cycle (3CY), January 03 2012, Seward Park, Seattle (Amar Ayyash). 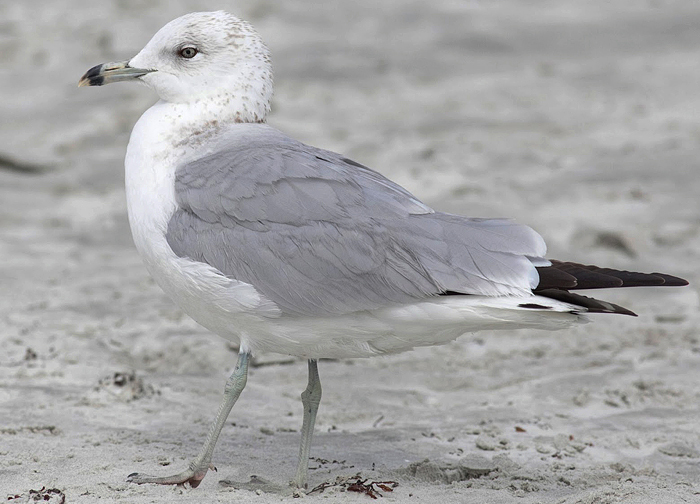 below: Ring-billed Gull delawarensis 2nd cycle (3CY), March 01 2013, Canaveral National Seashore, FL. (Tammy Karr). Head, body and coverts similar to adult, but spots on hindneck often browner and coarser. Alula dark with white edges and tip. Outer 5-6 primary coverts dark (sometimes dark colour reduced to shaft-streak, when broadest near tip). Scattered coverts (especially median and greater coverts) may show dark shaft-streaks. Lesser coverts and marginal coverts sometimes with dark spots. Tertials sometimes dark-centred / barred (but rarely all). Primaries similar to adult, but often slightly brownish-tinged, usually with small white mirror on P10 only (9-35 mm on inner web; sometimes lacking). Dark on outer web of primaries covers 120-160 mm on P8, 60-110 on P6-7 (on P7 often reaching primary coverts) and 20-35 on P5. P3-4 often with dark subterminal spots. Dark outer webs of primaries sometimes divided from paler bases by dark mottling. Dark markings on secondaries and tail, often creating irregular dark bars; in tail often asymmetrical or as isolated spots, most frequent on T1-4. Rectrices sometimes with dark shaft-streaks. >50% have traces of dark tail-bar: in Ontario 11% appeared white-tailed, 23% with complete tail-bar and the rest intermediate (Peltomäki 2000). 10-20% have dark secondary-markings. Underwing-coverts white, often with faint dark markings on median coverts and greater coverts. Eye on average darker brownish-yellow than in adult; sometimes dark as in first-years. Bill and legs similar to adult winter, but duller (more greyish- or greenish-yellow; rarely deep yellow). Bill-base often pink or fleshy and tip ivory to create a three-toned bill. above: Ring-billed Gull delawarensis 2nd PB moult (3CY), May 31 2011, Naperville, IL. (Chad Horwedel). As second-winter, but head and body white with dark spots lacking or restricted to a few spots on hindneck. With wear, wing-tip browner. Bare parts as adult, but orbital ring generally duller red. As adult; black shaft-streaks on outer primary coverts, small white mirror on P10 (max. 25 mm) and dark mottling in division between black and grey on P7-P8 indicates this age. Partly albinistic birds have whitish wing-coverts and pale brown primaries. A first-winter with ‘half’ a tail-bar (being faded and reduced in one half) has been described (White & Kehoe 1992). Very rare. 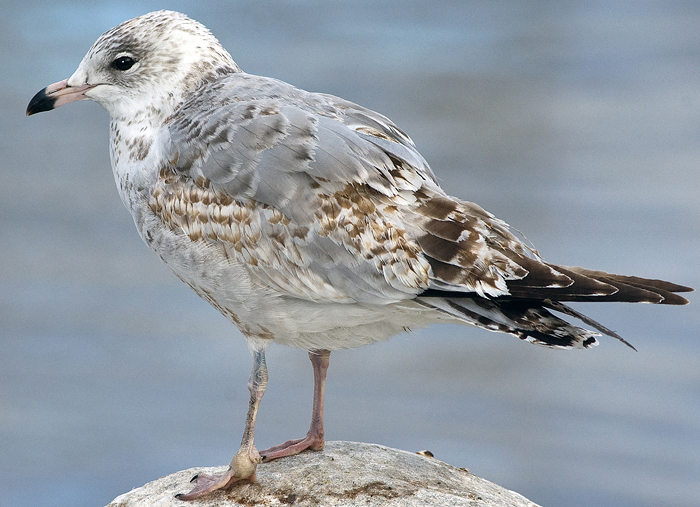 A claimed probable hybrid first-summer Ring-billed x Common Gull (England) similar to first-summer Common Gull, but with pale bill-tip and irregular tail-band (Kehoe 1992), could to my eyes well be an atypical Common Gull. A probable hybrid Ring-billed x Black-headed Gull nested with a Ring-billed on Lake Ontario, New York, in 1982. A ‘mystery’ gull at Brigantine, Maryland, in 1974 was probably a Ring-billed x Black-headed Gull (Richards & Gill 1976, Weseloh & Mineau 1986). Ring-billed Gull delawarensis 268 1st cycle (2CY), May 19 2010, Seaside Park, Bridgeport, CT. Picture: Keith Mueller. 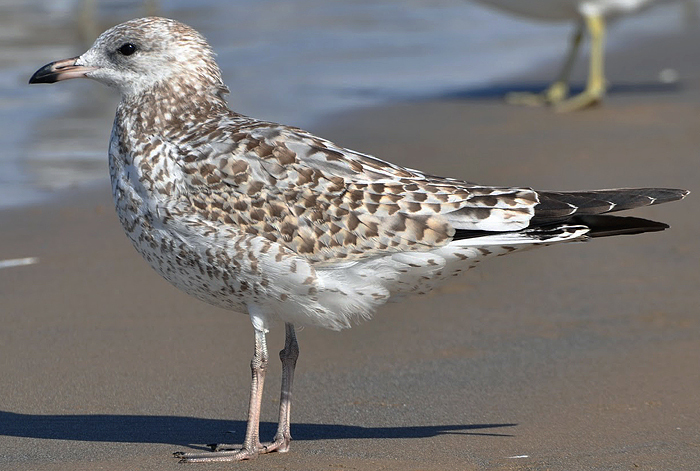 Ring-billed Gull delawarensis 0834-19990 1st cycle (2CY), May 15 2016, Birdseye Boat Ramp, Stratford, CT (41.17919 -73.12482). Picture: Donna Rae Caporaso. Ring-billed Gull delawarensis 1st cycle (2CY), May 13 2010, Cape Cod, MA. Picture: Grace & Bradley. Ring-billed Gull delawarensis 1st cycle (2CY), May 06 2014, Chicago, IL. Picture: Amar Ayyash. Ring-billed Gull delawarensis 1st cycle (2CY), May 15 2014, Chicago, IL. Picture: Amar Ayyash. Ring-billed Gull delawarensis 1st cycle (2CY), May 24 2010, Picnic Rocks parking lot, Marquette, Michigan. Picture: J.D. Phillips. Ring-billed Gull delawarensis 1st cycle (2CY), May 30 2010, Lakewood Lane, Marquette, Michigan. Picture: J.D. Phillips. Ring-billed Gull delawarensis 1st cycle (2CY), May 13 2014, Chicago, IL. Picture: Amar Ayyash.